Today I’m celebrating the release of His Desire, Book 2 of the Montclair Chronicles by Siren BookStrand. William Montclair, the only child and heir of the Earl and Countess of Ashford (Robbie and Emmy from His Obsession) has always done his duty. When he returns home after the war with Napoleon, he is determined to find a wife who will bear the children he needs and accept what he has to offer—marriage without love. Georgiana Janson, an impoverished soldier’s widow with a young daughter, worked as a nurse in the field hospital where she and met and fell in love with William Montclair. On their return to London Will sets her up nicely, but she realizes that she can’t accept what Will offers—love without marriage. When her circumstances change, Georgi must decide what she wants in her life. Too late, Will discovers what he needs most in his. Despite interfering relatives and answering a call to war, Will mounts his own campaign to court and win the love of his life. Loved doing the research for this book, most of this month’s Regency posts on my webpage/blog (ritabay.com) were bits of info collected along the way. Click the book cover to read an excerpt of or buy His Desire (M/F, Sensual) His Obsession is available there also. In His Obsession Emmy was kidnapped and sold into a pirate’s harem in Rabat, the capital of the pirate’s Republic of Bou Regreg. It’s in the Top 10 Mainstream Bestsellers this week at BookStrand. The blogs for the next two weeks will visit places from the Montclairs’ Regency World. 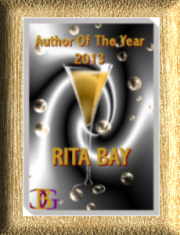 Many congratulations on another release, Rita! I shall eventually get around to reading them. Congrats on the release Rita. May you have much success!